I was on my way to visit a friend the other day, call it my lucky day, really, some reckless driver in front of me bump on a taxi causing a traffic jam, so I diverted my route, parking is hell in this area where my friend lives, I’m a highway driver and not a bumper to bumper driver so I decided to park some place I can manage. Since the house is still quite far, I have to find some short cut routes to get to her place on time. I was treading this alley when I spotted this girl crying, I took this first photo without her noticing me, but when I shot the second one that was when she notice me clicking. I was hesitant to ask why she’s crying on a broad daylight, so I just smiled and passed by at her. 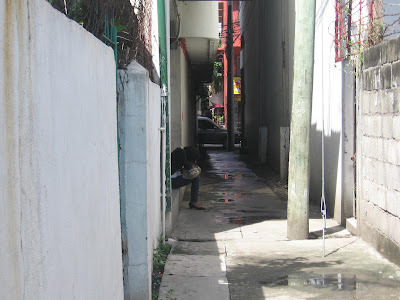 Just when I reached the other side of the alley, a man just her age was calling her and told her to stop crying. 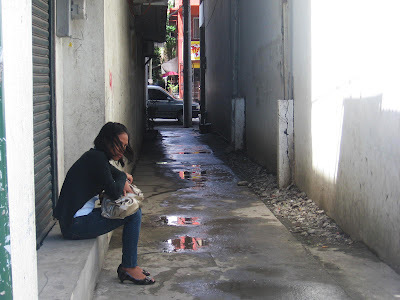 Me and my big ears eavesdropping, she cried because she saw him right in this alley holding and hugging someone else. Huhuhu, that’s why she cried a river. It rained hours before I got to this alley, you still can see the rainwater caught in the walkway.